Lead generating companies promising your business the sun, the moon and the stars in the sky, need to be viewed with a red flag. The process of getting your business ranked on popular search engines such as Google is not easy as 1-2-3. It takes time for a company to go from completely unknown, to a national, or local staple in the community. Some business owners who are new to the internet and Google, try to go at this alone sometimes and with mixed results, and a lot of money wasted. The best way to efficiently spend your advertising dollars is not to “wing it” own your on with some of the top lead generating companies online. Let there highly-trained representatives assist you. If you are a “weekend warrior” or a “do-it-yourselfer”, at least let the reps get you pointed in the right direction before you venture off on your own. If you are far too busy to live inside of your analytics page, watching trends. Alternatively, too busy to search for the best SEO keywords that consistently have been proven to have the most searches in a month there is a solution. Do your research when choosing from the best lead generation companies and let them take these tasks off your plate, while you focus on business operation matters. Furthermore, you must research the best lead generating companies with the best online tools. The company you choose can have a profound effect on the results you get in the end. In early life, a humble beginning can serve two purposes for a person. You can let it serve as an excuse for all your worldly problems. Alternatively, you can let it serve you with an inextinguishable fire within, that propels you to do great things in life. Like other people who have chosen not to let an uneven playing field get in the way of their dreams, Leo Malagon, the owner of Discover Hawaii Tours, knows this all too well. Malagon, the son of Cuban emigrates, vividly remembers growing up in New York City with his family. Money was so tight back then, Malagon and his family only had one bedroom in their small apartment. Malagon, like most kids, didn’t know his family was poor, grew up and learned to make good life decisions. He would join the U.S. Army when he came of age and just by chance, was stationed in Oahu, Hawaii. Malagon had never seen a place like Hawaii before and knew right away when his military days were over, he’d stay here permanently, and that is just what he did. “When I got out of the military, I started my business in Waikiki with a brochure offering to take people on tours,” said Malagon. Malagon found love when he married an ex-marine D’Manti. Together with his parents, and a few employees, he founded his company in 1995. There are many business startup success stories in the world today. However, for each success story, there are hundreds of stories that did not have a happy ending; such as life. Moreover, Malagon had that inextinguishable fire within not to fail and he knew he could not do it alone. “Google has changed the way we do business,” Malagon said. The company offers tours across the islands of Oahu, Maui, the Big Island, and Kauai, including volcano tours, hiking tours, and tours of Pearl Harbor. They use AdWords, Google’s advertising program, to help customers find their activities. “Luau” is one of our biggest search terms. Google helps people find our Big Kahuna Luau experience. 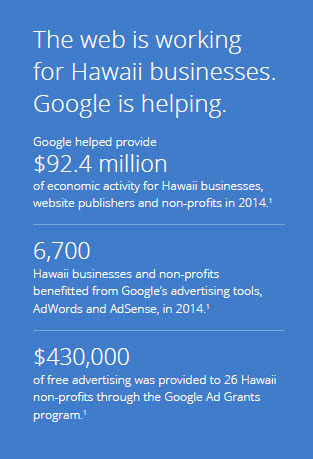 Google My Business helps Discover Hawaii get found on Google Search, Google Maps, YouTube, and Google+. “Ninety percent of referrals to our website come through Google,” said Malagon. Today, Discover Hawaii Tours is a thriving business. With a great team of workers behind him, Malagon has grown his company to a $25-million per year business. Malagon loves that his startup has turned into an island staple and has business plans to reach more than $100 million in sales. How does he plan to do this? 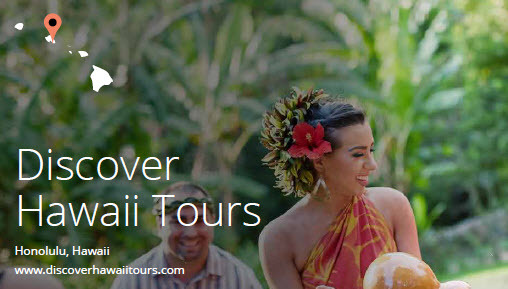 For starters, Discover Hawaii Tours has created some new product offerings. They now promote all-inclusive vacations, and he gives Google the create for helping him come up with the idea. Never one to brag about his philanthropist dealings, Malagon donates 10% of his earnings back into the community. 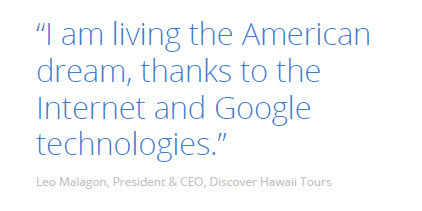 Google has done their part as they have helped create more than $92.4 million dollars of economic activity for businesses located in Hawaii. Conversely, they have statistics that show that 6,700 of businesses situated in Hawaii benefited from for the use of Google advertising tools such as AdWords and others. Lastly, Google is one of the largest donators of companies its size, gave away $430,000 worth free advertising to 26 Hawaii non-profits via the Goggle Ad Grants program. If you are ready to take your business to the next level, LeAds can help you create an adverting campaign using the full power of all Google has to offer to help your business stand out from the pack. This article was written by the LeAds copywriting team. LeAds is a Google Lead Generation Agency, specializing in Google AdWords https://www.google.com/adwords/ and Google SEO in the United States. Please visit our website at www.msalesleads.com for more information about making Google Search and AdWords work for your business.